MaidMAX Floating Shelf, a piece of decoration itself, adds a personal touch in the hallway for storage or in the living room for displaying your treasured photos or collections. A combination of beauty and functionality like this shelf has a lot to offer. Made of sturdy particleboard and metal bracket, this Wall Mounted Bookshelf is subjected to the demanding test for durability. 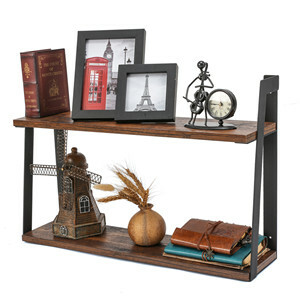 Each shelf measures 0.5 inches in thickness and holds up to 17.6 lbs, offering strength and spacious room for books, DVDs, photos, clock, ornaments and collectibles. Strong hardware are included for quick and convenient mounting. Measuring 23.5″ (L) x 5.8″ (W) x 15.6″ (H), the Floating Shelving Unit frees up precious floor space by making the most of your empty vertical wall space. Apart from being an excellent space saver, it helps to make your home safer by storing things out of the reach of your children, especially those which may pose choking hazard to them. 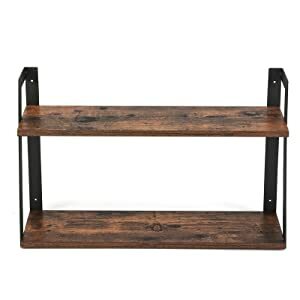 The visible wood grain finish in brown of this Wall Shelf gives a natural and rustic vibe that easily mixes in and enhances any décor. 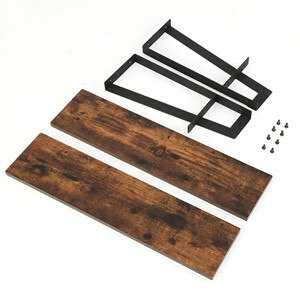 It allows plenty of display and storage room, perfect for mounting in the bedroom, living room, kitchen and more.